The updated SM951 is a fast M.2 NVMe drive built for laptops, but make sure you meet the system requirements before you buy. (+) Speed Freaks: Fast; compact; great for laptops. (-) Speed Limits: High price per GB; limited capacities; BIOS support for booting; OEM-only. Last week, we posted our new SSD test suite and set our baseline expectations. Our baseline SSDs consist of one of the fastest SATA drives, two good SATA SSDs in RAID 0, and Intel’s SSD 750 PCIe NVMe drive. The Intel drive is a force to be reckoned with, easily beating the other SSDs in most of our tests, but it’s also the first NVMe drive we’ve tested. Today, we’re reviewing Samsung’s first NVMe offering, the SM951 NVMe M.2 256GB. A quick overview of storage interfaces is in order before we continue. NVMe (Non-Volatile Memory Express) is a new standard designed specifically around the needs of SSDs, where previous SSDs used the AHCI (Advanced Host Controller Interface) command set that was built for SATA drives—which initially consisted solely of hard drives and other slow storage options. NVMe connects to storage via a PCI Express interface, opting to use the existing standard rather than trying to reinvent the wheel. The core differences between NVMe and AHCI are that NVMe has significantly more queues and supports more commands per queue (65536 queues and commands per queue, compared to one queue with up to 32 commands), it has more interrupt options, and there’s significantly improved parallelism for the interface and devices. If you’re just interested in what this means to the end user, NVMe has much higher bandwidth and some optimizations to reduce latency and improve throughput. Intel’s SSD 750 is awesome, but there are a few limitations. The biggest issue is price: The smallest version is 400GB and costs just under $400, while the larger 800GB and 1.2TB models double and triple the capacity and price. There are other potential concerns, though, like the need for an x4 PCIe 3.0 slot to realize maximum performance, and a motherboard that has BIOS support for NVMe. Intel offers the drive in a 2.5-inch form factor as well, though it requires relatively rare SFF-8643 (Serial Attached SCSI) connector. Basically, very few people are going to have a board with SFF-8643, so there’s not much demand for those drives. That brings us back to the Samsung SM951 NVMe M.2 256GB. This aims to take all the NVMe goodness and stuff it into a convenient M.2 PCIe form factor, naturally—we love names that tell you pretty much everything you want to know! Just to clarify a few things, it’s important to note that the SM951 M.2 PCIe SSD was already available a while ago, but the earlier release uses the AHCI command set. The SM951 NVMe is essentially the same core device but with some minor tweaks to switch from AHCI to NVMe; going forward in this article, when we say “SM951” we’re specifically talking about the NVMe model. There’s also one major problem with the SM951: It’s intended for OEMs, typically going into laptops, so it’s not widely available, though you can still find it for sale on Amazon.com and Newegg.com. One thing to note before we get into the results is that Samsung elected to send us their 256GB model for testing. This will have an impact on certain performance metrics as the larger SSDs often have better parallelism, particularly for write operations. Samsung specifies the 256GB model with read speeds of up to 2,150MB/s and write speeds of up to 1,260MB/s, while the 512GB model has slightly higher peak write performance of 1,550MB/s. So, how does the Samsung SM951 perform, and can it hope to dethrone the Intel SSD 750? As we noted in our revamped SSD test suite article, we’ve updated to a new test bed for storage, running a Skylake processor in a Z170 motherboard. We had initially planned on using our X99 GPU test system, but the M.2 slot unfortunately only runs at x2 PCIe Gen2. Which makes for an interesting comparison point, so we’ve added it to our graphs to show what happens if you run the Samsung drive on a narrower bus. Here’s our test system (except for the PCIe Gen2 results), followed by the benchmarks. Considering the relatively low capacity, the SM951 does well in our sequential and random transfer results. The Intel 1.2TB drive is faster, but if we had the 400GB Intel vs. the 512GB Samsung, things would likely be much closer—and you’d get 112GB of additional storage from Samsung. The QD64 AS SSD Random Write results are the one area where Intel still holds a significant advantage, but that’s a pretty unlikely use case for consumers. As we continue through the benchmarks, IOmeter confirms the AS SSD results, but an interesting thing happens when we get to the “real world”: Samsung wins out in both the file copy test and PCMark 8 Storage. The PCMark 8 Storage Score, of course, reflects system-wide performance, so the SSD has less of an impact and most of the drives are “tied,” but Samsung is clearly delivering better bandwidth. The same is true of file copying, where Samsung enjoys a moderate lead. Somewhat interesting is that even on an x2 Gen2 PCIe connection, the SM951 is still generally faster than SATA SSDs, including RAID 0 SATA drives, but there’s clearly a bottleneck. Here’s what the charts won’t tell you: The Intel SSD 750 is basically useless for laptops and notebooks. This is the intended market for the SM951, and not only does it offer great performance, but it does it in an M.2 form factor that you can find in most modern laptops. The catch is that you still need a laptop BIOS that supports booting from an NVMe drive; otherwise, the SM951 will only work as secondary storage. That sort of defeats the purpose of buying an NVMe M.2 device, which is probably why Samsung is positioning the drive as an OEM-only product. There’s a lot to like with the Samsung SM951, but even with great performance, it may not be the M.2 drive to get. Samsung just briefed us on their upcoming 950 Pro SSD, which will be a retail product with full NVMe support. Hopefully, that should mean better prices and wider availability, though we don’t have internal performance numbers just yet. Interestingly, Samsung didn’t compare performance of the 950 Pro with the SM951, but on paper there’s a bit of give and take going on. The SM951 uses planar NAND while the 950 Pro will use V-NAND, so 950 Pro should have better endurance and require less power. The peak read speeds are slightly higher on the 950 Pro as well, but peak write performance may be down slightly. In other words, while the SM951 is speedy, this review is really setting us up for the Samsung 950 Pro launch in October. There likely won’t be a huge difference between the two drives in overall performance, but the retail 950 Pro should be more easily available for purchase. If you don’t care about the M.2 form factor, e.g., for desktop use, the Intel SSD 750 1.2TB is still the drive to beat when it comes to pure performance; it also wins out for capacity, as the SM951 tops out at 512GB. 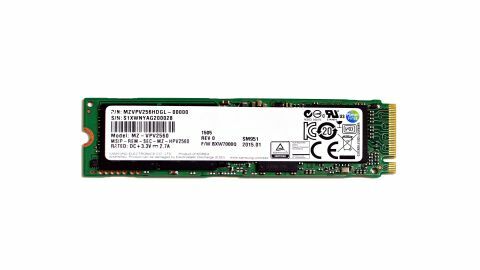 If you don’t need the additional space and you want an M.2 NVMe drive today, the SM951 is still a great drive and definitely worth a look. Frankly, there aren’t many other options out there, and of those that we’ve tested (more SSD reviews coming soon!) the SM951 comes out well ahead of the competition. But that price will still make you think twice, and you still have to deal with system requirements. There’s also the fact that as an OEM-only product, you won’t get any warranty from Samsung. Caveat emptor. Here’s some more food for thought. Samsung’s SM951 may be over twice as fast as a good SATA drive in many of our benchmarks, but for less demanding users, it’s hard to go wrong with the Samsung 850 EVO 500GB. Not coincidentally, you get more than twice the storage capacity of the 256GB SM951 for less money as an added benefit. It may not be the new hotness, but SATA is still more than fast enough for most users. That’s likely to be a recurring theme with high-performance SSDs for the coming year, but someone has to blaze trails and eventually the price discrepancy between SATA and M.2 drive should fade away. And by the time that happens, we should also see a wider installed base of motherboards and laptops with NVMe support. Samsung’s SM951 ends up being an awesome little drive with a few disclaimers. For those who fall into the target demographic, it’s easily the best of its class, but in the fast-changing world of SSDs that title may not last long. Swing by next month and we’ll see where things stand.